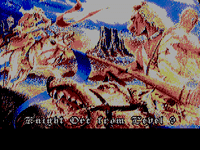 Knight Orc is a text adventure game by Level 9 released in 1987. The game is a standard text adventure with limited graphics on some platforms. It comes with a short novella by Peter McBride ("The Sign of the Orc") explaining the background to the story. Story: After a night of heavy drinking with friends, Grindleguts the orc awakes to find himself strapped to a horse and about to joust with a human knight. His "friends" are nowhere to be seen, and he must somehow escape from his predicament and get even with them. Source: Wikipedia, "Knight Orc", available under the CC-BY-SA License.